Mixed media painting entitled exposed 72″ x 42″. It is with great anticipation that I am planning an upcoming exhibit with my artist comrade Patricia Berube at the James Library & Center for the Arts starting on April 3rd thru 29th. 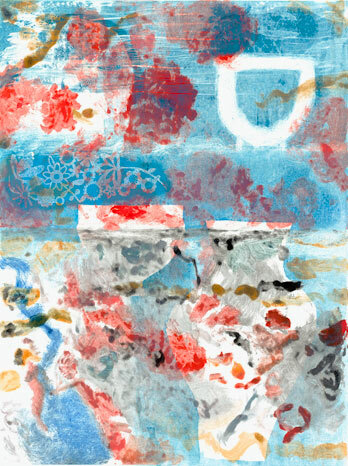 The pieces that I am presenting are recent paintings and monotypes that expose a personal side to my work. Interests that come though my artwork are a love of color, texture, scale, paint strokes and a sense of humor. After many years as a commercial illustrator, designer and art director I have taken the time to create pieces that interest me without the restrictions of assignment work. 30″ x 22″ monotype entitled ‘Dynasty’. Monotypes that will be included in the show are a way for my work to be more free with a suggestion of realism that lends itself to the viewer making their own conclusions and stories. Pieces will range in size from large 72′ x 42′ paintings down to smaller 4″x 6″ pieces. Please Join me. You are currently reading Special Exhibit in April 2015 at donna ingemanson studio.